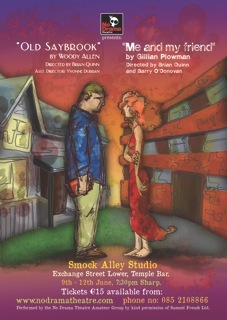 Venue: Smock All Studio, Exchange St. Lower. Gillian Plowman’s black comedy Me and my Friend and Woody Allen’s hilarious Old Saybrook united in an evening of soul-searching and tear-jerking laughter. Directed by Brian Quinn and Barry O’Donovan, Me and my Friend followed four institutionalized psychiatric patients who found themselves on an early release program in two small council flats. In this black comedy, hopes and dreams collided with moments of psychosis and skeletons from the past. Winding down from the thought-provoking first play, whilst rolling with the theme of complex relationships was Woody Allen’s Old Saybrook. We met an accountant and his wife as they returned to the house in which they once lived. Unfortunate secrets were revealed and relationships rocked in this farcical yet bizarrely topical tale of infidelity, directed by Brian Quinn, assisted by Yvonne Durran. Both plays were by kind permission of Samuel French Ltd.